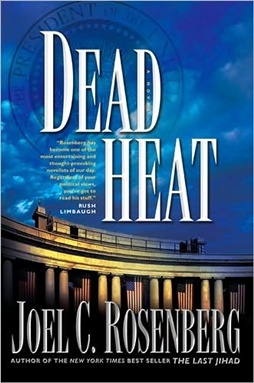 My delight was doubled when I picked up Dead Heat by Joel Rosenberg at the library. On first sight, I thought it would be another thriller action novel, along the likes of Dan Brown and James Rollins. The book is a page-turner with its suspense and playout of end-time prophecies. From the time I had a taste of James Rollins and his mastery in incubating fact with fiction to hatch a fascinating tale of thrilling action, I got hooked onto this style of writing. And so, now Rosenberg presented me with another series of books written along a similar vein. I love how the authors threaded real fact with imagination to weave an almost credible story bordering on real-life investigative work. Some of the plots and subplots mentioned in their books bring a thrill along your spine as they hint of a sinister slant to real world events. Dead Heat is a roller-coaster ride that had me gripping the political thriller till the end and then, left me rushing to get hold of its earlier prequels. It brings into play Biblical prophecies of the end-times (or eschatology) and shares bone-chilling insights to how it parallels with world happenings as they unfold. What is scarier is that, each of the 5 books in the series was written/published just before the major events mentioned in them happened in our world. Verdict : 9/10. Two thumbs up!